That very English Christmas tradition of putting on a musical-comedic theatrical production to entertain the family, occurs in many villages, towns, boroughs and cities for some weeks during December and January. The tradition may well have stemmed right back to Roman times when a “Lord of Misrule” was appointed to oversee the wild party festivities in the pagan tradition of Saturnalia. Historically a ‘pantomimos’ in ancient Greece was a group who imitated all, and were accompanied by sung narrative and instrumental music, often played on the flute: pantos = all, mimos = mimic. This was a popular form of entertainment, and became so in Rome, because like theatre it encompassed genres of comedy and tragedy, and evolved over time during the different eras. In the Middle Ages when Kings and their Courts, professionals – the apothecaries, the tradesmen etc were all able to travel more easily to enhance their rank, their knowledge, increase their trade, learn new crafts - the entertainers went too. Theatre in Italy had been popularised through the Commedia dell’arte (Comedy of Craft) being characterized by masked ‘types’, the advent of the actress, and improvised performances based on sketches or scenarios. From these traditions are characters we recognise today – Harlequin, Pantelone, Petrushka, Pierrot and Clown, while since the Victorian times pantomimes have tended to be based on Nursery Rhymes, Fairy Tales, established story lines. 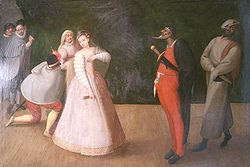 Commedia dell’arte is notable in that female roles were played by women – whereas in England theatre critics generally denigrated the troupes with their female actors .. Ben Johnson (1572 – 1637 English Renaissance dramatist, poet and actor – a contemporary of Shakespeare) referring to one female performer of the commedia as a “tumbling whore”. These groups of professional artists travelled from province to province in Italy and then France, they improvised and told stories which told lessons to the crowd and changed the main character depending on where they were performing. Each story had by that time the same fixed characters: the lovers, father, servants (one being crafty and the other stupid) etc and can still be found in today’s pantomimes. 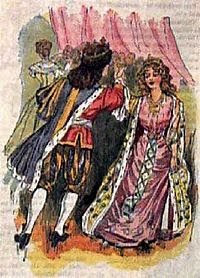 These performance conventions continue – the leading male juvenile character (the principal boy) is traditionally played by a young woman, clearly laying out her female charms; while an older woman (the pantomime dame – often the hero’s mother, is usually played by a man in drag. The gender role reversal resembles the old winter festivals and can be traced back to pre-Christian European festivals when it was customary for the natural order of things to be reversed. Risque double entendres are used, often wringing innuendo out of perfectly innocent phrases: this is in theory over the heads of the children in the audience. The audience is encouraged to participate – to boo at the villain, “awwww” at the poor victims, to call out “He’s behind you” – warning the character that they’ll be overheard; and “Oh, yes it is!” and “Oh, no it isn’t!” in making sure the ‘correct’ information is given, ensuring a noisy interest by the audience.British pantomime is now a popular form of theatre, incorporating song, dance, buffoonery, slapstick, cross-dress, in-jokes, audience participation and mild sexual innuendo. The schedule is demanding two shows a day, six days a week .. but some actors just love it and settle in to the annual routine in their planning, while actors we would refer as serious professionals accept parts, and overseas actors come over to join in this peculiarly British theatre. In the past Sir Ian McKellen (the great Shakespearean actor, as well as Gandalf in The Lord of the Rings) played Widow Twankey in Aladdin in 2004 and 2005; "At least we can tell our grandchildren that we saw McKellen's Twankey and it was huge," said Michael Billington, theatre critic of The Guardian, December 20, 2004, entering into the pantomime spirit of double entendre (see Wikipedia). 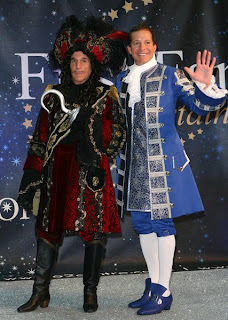 In recent times, the in pantomimes have featured soap stars, comedians or former sportsmen rather as celebrity attractions, supplemented by jobbing actors and pantomime specialists. Pamela Anderson, this year, is playing the genie in Aladdin at the New Wimbledon Theatre; The Fonz (Henry Winkler) plays Captain Hook in Peter Pan at the Liverpool Empire. A good time is had by all in this extremely British tradition, though around the world Pantomime is now performed in mainly British settled countries, or where there’s an ex-pat community – Australia, Cambodia, Canada, France, Germany, Switzerland and the Netherlands to name some countries. In America pantomime as such is seldom performed, and as a consequence Americans tend refer to the art of mime (as was practised, for example by Marcel Marceau) as a pantomime. 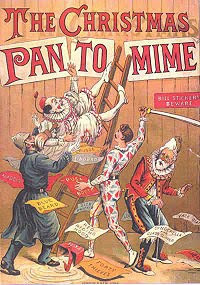 Some shows come from pantomime traditions, especially Peter Pan, and are performed quite often – the tradition is spreading out and becoming part of Christmas time American style. This is the time for those with theatrical ambitions to tread the boards – covered in thick gaudy make up, singing sometimes bawdy songs, exhorting the audience to participate and to provide a slapstick entertainment for all to enjoy. Dear Mr Postman – my Ma seems well – she’s had two days of sleep having sat up watching Hamlet the other night! How much she took in .. I do not know! The weather is terrible today, but at least we have rain and not the snow that's in the north. 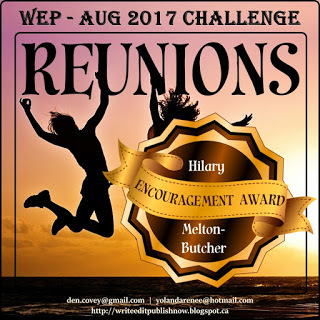 Dear Hilary, I thought of you over the holidays and hope that you got to spend some peaceful and rewarding time with either yourself or those you love. Again, I just laughed out loud over parts of this post. AND, I can't get over the things that you know...and know SO much about. I find that simply fascinating. You are a plethora of tidbits, facts, amusing anecdotes, history and humor. I am left spinning from how much you know. I LOVE this part that you wrote: "Risque double entendres are used, often wringing innuendo out of perfectly innocent phrases: this is in theory over the heads of the children in the audience. The audience is encouraged to participate – to boo at the villain, “awwww” at the poor victims, to call out “He’s behind you”..."
That just sounds sooooooooo fun and delightful and something that I would just get so involved with. How much more interactive and fun than just sitting there watching a 2 dimensional play or movie or show on TV. To allow the audience to actually take part in the event is just priceless. We have lost so much of that, at least in my culture. My husband is a Mohawk Indian and a professional storyteller (along with being a professor) who shares Native American stories from many tribes. He ALWAYS gets the audience involved. They just LOVE it. The kids go berserk and although most of the adults are slower to let down it doesn't take them long before they have lost themselves to story and are totally involved. I think that audience involvement fascinates me as much as watching him tell stories. I LOVE to watch the people's reactions and faces and hear their spontaneous outbursts. I going away feeling like I've connected more fully with humanity. Hi Robin - you're extraordinarily kind .. 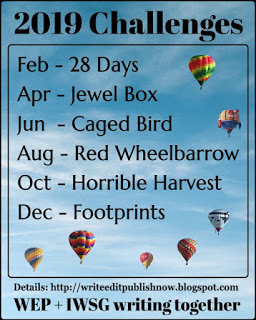 I don't want to inflate my own balloon or your thoughts .. I mix and match what I find, what I know and what I want to put across .. often finding other tidbits along the way that interest me and I hope (as they seem to) others ..
Regrettably that passage isn't mine - but I too loved it and just recreated it .. it is as you say so Pantomime. That must be wonderful to be a storyteller .. especially now as we're becoming more accepting and wanting to learn about our pasts. I can believe his audiences just love that participation .. as you say the Kids love it and get so excited in their eager anticipation of the Show. Thank you, thank you - I just love the things I find out about as I know my mother will (or would have) .. but she keeps giving me ideas to write about - amazing how she can interact with it all - the iphone makes an amazing difference, as she can see the pictures. I am so grateful for your love and hugs across the Ocean .. and your video of being blown over is great - I'll describe it to Ma at some stage - we take each day at a time & see what she wants to do. I am feeling better with only one to worry about or spend time with .. I reemember Julia Roberts played Peeter Pan. 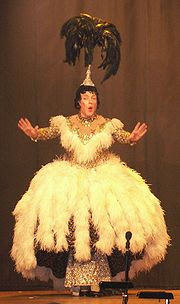 I wunder if she was in a pantomime in it? I must not let my Jannie reed this bloging poste, wit werds like tumbling whore, my Jannie is mutch shelterred frum sutch things. She prefer werds liek bounsing whore or jummping whore. Ha-- I maed a joking!! Hi Devon .. thanks for commenting - it never took off is my understanding. So it really is a British entertainment .. much loved for family entertainment here. Hi Blue Bunny - I commented .. but obviously forgot to post it! No - I dn't tink luscious Julia Roberts played with us here - but now she has kiddos .. they mite be wtching tuguver. It's gd U prtect that Jannie of Urs .. 'nd just keep her reeding bounsing whore or jumping whore - I'll hae to wtch mi linguage in futur ..
- gd joking .. jst dn't let Kelly see .. tht's NB - mke sur she's gets gud Englush tchr .. Enjoy's tonite .. do U hide ur ears? Much luvs too & hugs from me, mi muvver and the Hardwick boy .. to yous all - & squirrel Hardwick .. Yes my kelly's eers are too yung. She mostly goes on het club pengwin site. Or watching tee vees. she not reeding mutch bloggs, my kelly, evin tho she starting own blogg resintly. Kids! they is. fikkel. I liek yor new spelings, Hilary, yoo getting beter, liek me! Hi BB - gld tat Kelly's is happeee wiv her pengwin site .. we wutchd "Happy Feet" - my muver enjoyd it. Kelly dooong her owne blogg - gud fur her .. as U says kidz theys chop and change .. I liek yor werd fikkel! My Afrikaans cumz to the fore - bise bi ..
O my , I think I'm a bibliophile! Thanks for that word, I just love books ;-) If I were rich, I'd have my own library. You'd be welcome of course to just read in there and maybe we can chat over coffee or tea. Have a happy new year Hilary! & I'd be delighted to come over and read with you, chat and swap ideas over tea or coffee..
Wassail .. and "The Twelve Days of Christmas"
Mum and Hardwick - decking out the tinsel ..